Discovery of remains of a gigantic palace in Bolaghi Gorge and its similarity to the constructions of the time of Darius I, Achaemenid King, in Persepolis show that it was built during the same period of time. 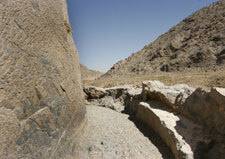 Tehran, 15 May 2006 (CHN) -- Iran-French joint archeology team at Bolaghi Gorge succeeded in discovering and identifying the remains of a gigantic palace, believed to be from the Achaemenid era (648 BC-330 BC), during their second season of excavations in the area. "Before the start of this season of excavations, our geophysical tests in area number 33 of Bolaghi Gorge had revealed to us the possible existence of a huge building near the Sivand Dam. Clay artifacts found in this area showed that this building used to be the residential palace of the Achaemenid kings. With the start of the new excavation season, we resumed our excavations in area number 33 with this attitude," said Mohammad Taghi Ataee, head of the Iran-French joint archeology team at Bolaghi Gorge. "After we started our excavations in the historic hill where this monument is located, we realized that it consisted of one historic layer only. Since no other layers were constructed on top of this layer, archeologists were hoping to unearth the entire palace intact. However, after they made their trenches they got to a number of wells which had been dug by illegal smugglers and also traces of bulldozers which had caused serious damage to this ancient Achaemenid palace," said Ataee. Plundering of archeological sites by the smugglers has become a common issue in archeology. However, according to Ataee, archeologists believe that illegal diggers cannot be held responsible for destroying of this palace by bulldozers, and it was a deliberate act by an unknown person or group of people who intended to devastate this place for a reason that is not clear for archeologists. "The archeology team kept removing the debris caused by the bulldozers until they got to the base of a pillar similar to those used in the construction of the palace of Persepolis in Fars province, although smaller in size. The base of this pillar which looks like an inverted bell is built by the same stones used in the construction of Persepolis. The stone is so carefully varnished that one may clearly see the reflection of oneself in it," added Ataee. The height of this discovered base is 35 centimeters and it has a diameter of 50 centimeters. There are signs on this base which were meant to level it off, a method commonly practiced during the Achaemenid era. "Based on the evidence, this palace must have belonged to either Darius the Great, the Achaemenid King who ruled between 521 and 486 BC and built the famous Palace of Persepolis, or the kings who preceded him. However, it is more likely that the palace belonged to Darius," said Ataee. In addition to this pillar base, the royal seat of this palace, built using soil and condensed sand, several pieces of clay bricks, and three clay walls constructed in a row were discovered by the archeologists. The top of the walls has been destroyed by bulldozers; however, archeologists are hoping to find the construction plan of this palace by studying these walls more carefully. Regarding the size of these clay bricks, Ataee said, "These clay bricks are in different size, some are 35 by 33 cm, some 17 by 33, and some others are 33 by 33 centimeters. They were probably used to cover the floor." Bolaghi Gorge is an endangered historical site in Fars province, near the ancient site of Pasargade, threatened by the Sivand Dam built in its vicinity. Although the dam is not flooded yet, it is clear that with its inauguration Iran will say farewell to one of its most valuable cultural heritage sites. Although Ataee announced that inauguration of the Sivand Dam will not directly affect this Achaemenid Palace since it is located in an area which is relatively far from the Sivand Dam, the humidity caused by the dam will certainly destroy this palace in a long run. The Iran-French archeology team will continue its excavations in Bolaghi Gorge until June 5 to save this ancient site as much as possible before the inauguration of the dam, the date of which has not been announced yet.